Plug and play usb microphone K669B that connects directly to your computer or laptop's USB port for record your music or podcast with ease.Solid sturdy construction design with stable tripod stand is convenient when you are taking voiceovers or live streams on YouTube.Recording microphone with additional volume knob itself has a louder output and is more sensitive,your voice would be heard well enough when gaming , skyping or voice recording.USB-powered design condenser microphone no need the 48v Phantom power supply, good for voice chat, voice overs and streaming broadcast. 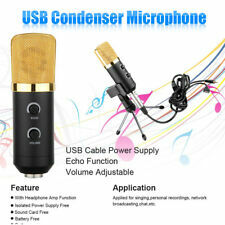 Cardioid polar pattern usb microphone for recording captures your voice properly,produce clear smooth sound without static noise in the background. Capture your voice in stunning detail with the award-winning Snowball USB microphone. Record music, audio for YouTube, podcasts, voiceovers, and more with the included PreSonus Studio One Artist recording software. And start creating instantly with quick-start templates handcrafted by Blue’s audio engineers. Get your creative ideas out of your head and onto the Internet faster and easier than ever with Snowball Studio. At A Glance:Capture studio-quality vocals with the award-winning Snowball USB mic Produce music, audio for YouTube, podcasts and more with PreSonusStudio One Artist software Create instantly with quick-start templates STUDIO-QUALITY SOUND WITH SNOWBALL Capture studio-quality audio for vocals, music, and multimedia production with Snowball—the world’s easiest to use professional USB microphone.Snowball featuresBlue’s legendary condenser capsule technology to deliver natural sound directly to your desktop. Three pickup settings—cardioid, omni, and cardioid with -10dB pad—accommodate any recording situation. Effortless plug-and-play operation lets you plug right in and start recording with amazing quality—no extra gear needed. STUDIO ONE ARTIST RECORDING SOFTWARE You don’t need to be a famous producer to create studio-quality recordings. Snowball Studio includes PreSonus Studio One Artist Blue Microphones Edition recording software, which gives you professional tools and intuitive workflows to help you start recording fast—just hit record and go. Capture your voice for songs, audio for YouTube videos, podcasts or voice-over projects. Layer multiple vocal and instrument tracks to create fully produced songs. Even edit and piece together multiple takes to sculpt the perfect vocal performance. And with a 32-bit audio engine offering superior sound quality, you’ll be able to produce professional recordings with amazing speed and precision. GET STUDIO SOUND IN SECONDS WITH QUICK-START TEMPLATES Snowball Studio’s quick-start templates provide everything you need to get professional-quality recordings for music, podcasts and voice-overs in seconds. Automatic track setup and dialed-in sound processing gives you rich vocals and instruments for release-ready tracks.Features:Vocals and Instruments–record studio-quality vocal and instrument tracks, including loud sources like guitar amps. Podcasting - create professional podcasts quickly with automatic track setup and handcrafted vocal sound processing. Audio for YouTube - get professional results instantly with automatic track setup, and sweeten your vocals with sound processing. Voiceover and Dialogue - record dialogue and voice overs with professional vocal processing. Get your Blue Microphones Snowball Studio All-in-One Vocal Recording System today at the guaranteed lowest price from Sam Ash Direct with our 45-day return and 60-day price protection policy. Take Your Live Vocal Performances to the Next Levels with the Best Stage Microphones by Fat Toad! Are you looking for a reliable, hi-fidelity vocal microphone for your music performances? Why not get a set of 2 to keep you equipped for all your live gigs and offer you professional quality at an unmatched price? Work with the Best! Boasting articulate mids, a punchy bass and a live, full-range response with high GBF, these cardioid, dynamic unidirectional stage mics will take your music performance to a whole new level! With a frequency response of 50 Hz to 16 kHz and aluminum alloy voice coils, these microphones offer a smooth and natural sound with great clarity and minimum distortion. Stop Wasting Money On Unreliable Mics That Fail You After a While – Invest In the Best Set of Stage Mics That Will Last! Don’t compromise the quality of your performances with cheap microphones that break or fail after only a few gigs! Equipped with a durable, shockproof grille that will resist frequent use or accidental falls, these cardioid dynamic microphones promise to last and go without a hitch for a really long time, saving you tons of money in the long run! 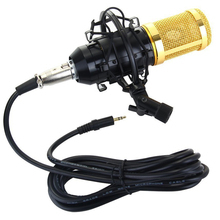 Product Specifications: Frequency range: 50 Hz to 16 kHz 600 ohms rating Power supply: Off/on switchLength of each microphone: 6.5" Connector type: 3-pin XLRGross weight: 10 ounces eachBest Value On the MarketIn this package you will get a set of 2 microphones and 2 mic clips that will last for years to come and offer outstanding quality performance in all your live concerts. Get It with Confidence! Backed by a 1 year replacement warranty and a 30 day money back guarantee, you have nothing to lose! Can you really afford to miss this opportunity? Order Yours Today! 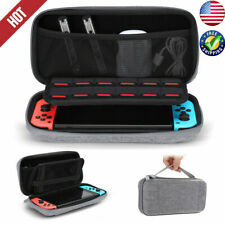 Click “Add to Cart” now, While Supplies Last! THE ULTIMATE MIC IN STAGE PERFORMANCE: Boasting a live, full-range response and a deep bass, this pack of 2 cardioid dynamic microphones offer a smooth and natural sound and will work perfectly for any live music performance: from peaceful parties and jazz clubs to karaoke singing, vocals, recording, podcasting and loud stages. Their unidirectional design makes them sensitive to sound from one direction only and promises a high level of GBF (gain before feedback).MINIMUM DISTORTION: These professional handheld microphones feature exceptional articulate mids, a frequency range of 50 Hz to 16 kHz and aluminum alloy voice coils, offering an unmatched level of clarity and detail in your voice. The result? Clear, intelligible lyrics and a superbly warm tone with the perfect balance of brightness that will not sound harsh to the ears. 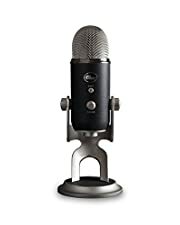 The high-fidelity sound allows for a nice tonal definition with minimum distortion.DESIGNED TO LAST: Equipped with an extremely durable, shockproof grille that will safely protect the mic elements from damages, these cardioid dynamic microphones are a must-have for any professional or amateur singer. If you need a set of reliable microphones that will withstand years of use without failing in anyway, then these mics won't let you down.COMPLETE PACKAGE WITH 2 MIC CLIPS: Together with your 2 dynamic, handheld microphones you will also receive 2 mic clips, completely free! Dare to compare! You will not find this combination of quality and price anywhere on the market!BUY WITH CONFIDENCE: These cardioid dynamic microphones are covered by a 1 year replacement warranty! In the unlikely event that there is a failure or a defect in these microphones, you can request replacements, in no time! With nothing to lose, order your set today and enjoy professional, hi-fidelity mic performance! Personnel: Mark Newton (vocals, guitar); Troy Engle (vocals, guitar, mandolin, fiddle); Mike Munford (vocals, banjo); Bob Goff Jr. (vocals, upright bass); Ronnie Simpkins (bass).Recorded at Doobie Shea Recording Studios, Boones Mill, Virginia. The Shure SM57 Dynamic Microphone is the renowned mic is used by legendary performers and the latest up-and-comers. The SM57 has set the industry standard by defining the way instruments should sound, which is why it's used by any serious musician or recording professional. Its warm, clean sound along with its carefully contoured presence rise make it ideal for a wide range of instrument miking applications, particularly guitar amplifiers and drums. The SM57 features a uniform cardioid pick-up pattern that isolates the main sound source and minimizes background noise. 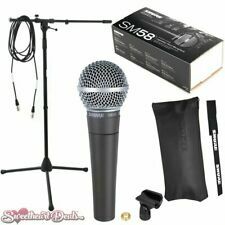 Most remarkably, the SM57 offers amazing functionality for a price that's well within reach of any musician. Human Fortress: Jioti Parcharidis (vocals); Torsten Wolf (guitar, background vocals); Volker Trost (guitar); Dirk Marquardi (keyboards, background vocals); Pablo J. Tammen (bass, background vocals); Apostolos Zaios (drums).Recorded at Area 51 Recording Studios, Celle, Germany. Ghost: Brian Moss (vocals, guitar); Shane Stevens (guitar, background vocals); Jordan Schalich (bass, background vocals); Randall Bleichner (drums, background vocals).Recorded at Electrical Audio, Chicago, Illinois. 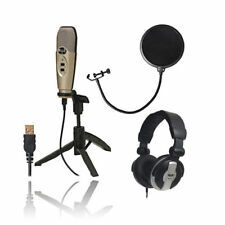 Manufacturer Part Number: HRS1HighlightsEverything you need to get started recording in one simple packageIncludes USB microphone, USB cable, isolation booth, shock mount, pop filterAlso includes a mini tripod stand for desktop useAll for less than the price of one typical USB mic!Talent All-In-One USB Home Recording Studio -- Vocal Booth - USB Mic - Shock Mount - Pop FilterThe new All-In-One home recording package from Talent Sound & Lighting gives you an awful lot of oomph, at a price you won't believe. 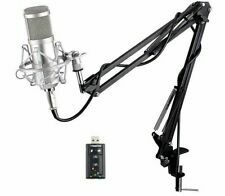 You get a mini vocal booth, USB mic with cable, shock mount, pop filter, even a mini tripod stand for desktop use -- all for under 100 bucks?! Yes. All for under 100 bucks!The USB-1 microphone offers a super-simple plug and play solution to recording at home (or on the go with your laptop), and it sounds frickin' awesome! No expensive preamps and/or interfaces to buy or hassle with. No drivers to install or be vexed by. Just plug it in to an open USB port, and BAM! You're ready to record in your favorite DAW or recording software. A tight cardioid polar pattern keeps the recording focused on your voice or instrument, rejecting ambient noise.YouTubers, podcasters, vloggers, home recording buffs, and others will appreciate the attention to detail, quality, and simplicity of this package. The VB-1 mini portable vocal booth is already one of Talent's top-selling items, so adding a great sounding USB mic, pop filter, and more goodies makes it a no-brainer for anyone interested in computer-based recording or audio production of any kind.Isolation Booth Specifications: Overall dimensions: 19-1/4" (fully opened) to 5" (closed) wide, 12" high, 10" (closed) to 3-1/2" (fully opened) deep Threads: 5/8"-27 TPI Adapter dimensions: 5-7/8" long, 5-1/4" high Adapter adjustable depth range: 1" to 5".Pop Filter Specifications: Overall diameter: 6" Gooseneck length: 11-1/2"Microphone Specifications: Element: 14 mm back electret condenser Polar pattern: cardioid Frequency response: 20 - 17,000 Hz Sensitivity: -34 dB ± 2 dB (0 dB = 1v/Pa at 1 kHz) Output impedance: 1000 ohms Load impedance: 100 ohms (at 1 kHz) Equivalent noise level: 16 dBA Max. SPL: 132 dB (at 1 kHz, 1% THD) S/N ratio: 78 dB Works with Windows 2000/XP/Vista/7/8/10/Mac OS systems without installing driver.NOTE: The All-In-One bundle does not include any software; however, many great software recording solutions are available for little or no cost online. We recommend Audacity as a free, easy, and effective recording program.NOTE: The mini tripod stand included with this bundle is designed to support the USB mic only. It is not designed to support the isolation booth. A full-size microphone stand is not included; we recommend our Talent SQMS1 (part number 233-014).Talent All-In-One USB Home Recording Studio -- Vocal Booth - USB Mic - Shock Mount - Pop FilterBrand: TalentModel: HRS1Part Number: 233-090UPC: 848864029993Product Category: Microphone Windscreens & GrillsUnit of Measure: EAWeight: 7.0000 lbs.NOTE: International/PO BOX deliveries are not available.The item can't be shipped to AF, AA, AC, AE, AM, AP, HI, AK, PR in the Unite States.